Tomorrow, Tuesday, April 4, marks 49 years since the assassination of Martin Luther King Jr. To honor King's legacy, hundreds of New Yorkers are rallying at the state Capital to demand universal healthcare. 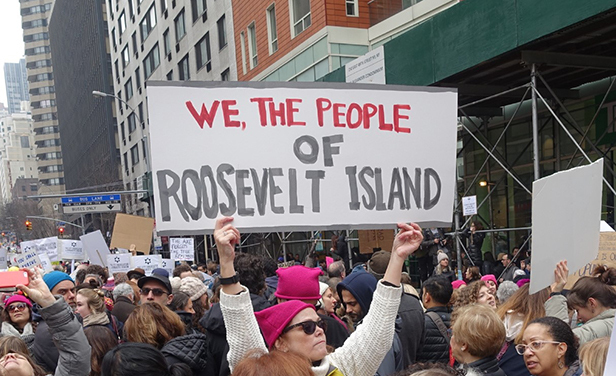 Three Roosevelt Islanders from the Indivisible Roosevelt Island chapter are going, Lorraine Altman, Susan Wald and me. New York Health Act would guarantee healthcare to ALL New Yorkers regardless of income, wealth, place of employment, or immigration status. To your own NYS Senator. (Senator Jose Serrano 212-828-5829) Ask them to cosponsor New York Health (S4840). Thank him for being a sponsor and ask him to do everything in his power to gain additional legislative support for the bill. To your NYS Assembly member. (Rebecca Seawright 212-288-4607 or 518-455-5676) Ask them to cosponsor New York Health (A4738). To Kemp Hannon (516-739-1700), the Republican from the 3rd Senate District who chairs the Health Committee. Ask him to please support New York Health (S4840) - it's good for the people in his district, it's good for business, and it's good for all of us in New York State! Thank you for being part of the fight to to bring healthcare as a human right to all New Yorkers. Let's work together to make sure New York State leads the way! More information on Indivisible Roosevelt Island available at previous post, the Indivisible Roosevelt Island Facebook Page or email address.